Now, there are two types of arepas: Venezuelan and Columbian. While they’re both very, VERY, similar to the untrained American eye; any Venezuelan or Colombian native would tell you otherwise. Main difference? The fillings. For starters, Colombian arepas like to stick with their roots. What some might call a basic flavor profile, the Colombians rejoice as a traditional daily meal. Most colombians eat arepas EVERY. SINGLE. DAY. I know, I’m jealous too. The way they make these arepas is typically by taking the hot corn cake fresh of the skillet and putting butter on top, to melt. Then adding some thinly sliced queso fresco or mozzarella cheese. Served mainly for breakfast, these delicious cheese cakes are a typical side dish to Colombian dinners. But, don’t think that colombians are just simply eating plain, basic arepas. They have over 5 varieties of cornmeal to make their arepas; offering an amazing variation of taste and texture. On the other hand, Venezuelans use arepas as main dish -- Amazing, I know. They eat arepas for breakfast, lunch or dinner. Sometimes they do the traditional butter and cheese as well; but instead of adding it on top they slice them open and stuff them. Breakfast they stuff them with eggs, chorizo, and avocado. Lunch and Dinner can be anywhere from chicken, to beef, to veggies. You name it, you can put it in an arepa. These are perfect for any meal, snack, or party because they’re super quick, relatively simple, and will even please your gluten-free friends and/or calorie counters. Seriously though, they’re only around 150 calories (unstuffed that is)!! You’re only four steps away from fresh arepas! In a bowl, combine the cornmeal and salt. Mix with hands, so that salt is distributed evenly. Add in the water ½ cup at a time. Make sure the water is fully incorporated after each ½ cup, to ensure an even consistency throughout the dough. Once all of the cornmeal feels incorporated you should start to feel for thickness (side note: you do NOT need to use all the water). The dough should start to feel soft and moist but not mushy. If your dough feels slightly dry, add a little extra water. If your dough feels too wet, add a little extra cornmeal. Now that your arepa dough is ready, it is time to start formulating your patty. Grab about 2 ½ tablespoons of dough (this is a rough estimate, base your size off how large you want your arepa to be). For thicker, stuffed arepas, grab a little extra dough. 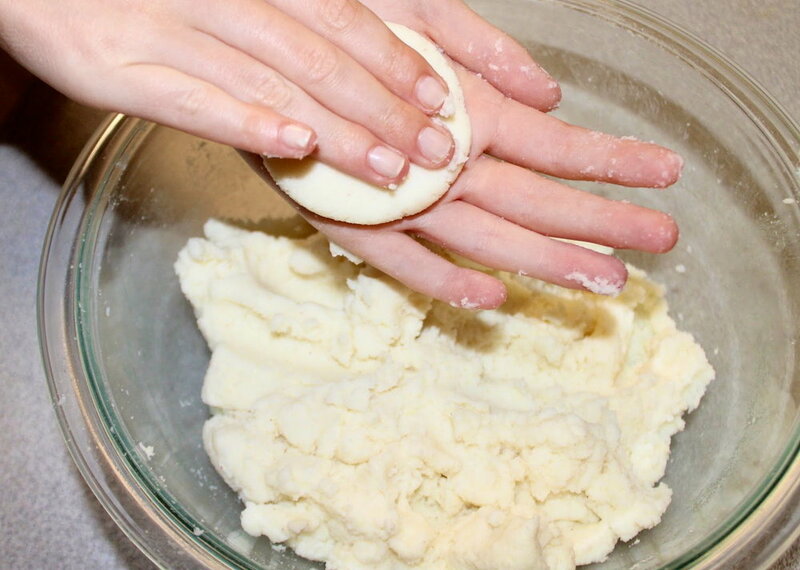 Start by rolling the dough into a ball, which should be slightly larger than a golf ball. Once this is completed press the dough in between your two palms to flatten it out into a disk. Start to flatten it out, using your fingertips to enture consistent thickness. It should be about ¼ - inch thick. If you’re making a stuffed arepa try and make your disk a bit thicker and make sure the edges are slightly thicker than the center. Preheat a skillet or grill-pan to medium-high head. Spray non-stick canola oil onto the pan or regular vegetable oil, so that it is coated in a thin layer. Once your oil has started to heat place the disks onto the oil. You should cook each thin arepa for about 3-4 minutes one each side, and the thicker arepas for about 5-6 minutes on each side. When your arepas are finished cooking, they should be golden brown on either side. If you’re making Colombian-style arepas, place butter and thin layers of mozzarella or queso fresco cheese on top immediately. The butter will start to melt and the cheese will soften slightly! Enjoy once cool enough to handle! If you’re making Venezuelan-style arepas, take them off the heat and allow them to cool until they’re easy enough to touch with your hands. Once the arepas have cooled slightly, slice them open 3-quarters of the way with a thin serrated knife. Fill each arepa with your favorite meats, cheeses, and vegetables. A typical Venezuelan filling is the “Reina Pepiada”, which is shredded chicken mashed together with avocado and cilantro.